This was dramatic and significant and very clear. I thought i would hear reports about a meteor landing somewhere in SF or the ocean. Or, read about other reports of people who saw it. 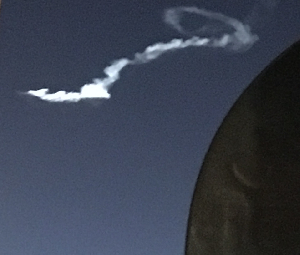 I've never seen anything so clear, and large- fast falling w/ a real comet-like trail behind it. Those around us sitting outside, all were impressed. Though it was past sunset, the sky was still light enough. I was sitting outside in Russian Hill area of SF, facing West. It was falling toward the South direction. I uploaded a photo that was taken about 2-3 minutes after it had fallen. Sorry i didn't take one earlier. This was a HUGE train of light. The straight trail lasting a minute. And it was white, and wide. I finally took a photo, two minutes later, and three minutes later. By that time, the trail had curved and no longer straight. But i was surprised that it lasted as long as it did, at least 5 minutes.